Specialized Canon camera repair shops are becoming increasingly accessible throughout the world. Fortunately, the well-built cameras don't need an excessive amount of repairs. Still, knowing that there are places you can take a broken Canon camera to get fixed is comforting. Canon is one of the most trusted brands in the camera industry. Both professional and amateur photographers appreciate Canon cameras for their outstanding workmanship and innovative features. The company has a full line of point-and-shoot digital cameras as well as professional-grade DSLR versions. All new Canon cameras come with a one-year limited warranty to guard against damage and defects. Canon prides itself on its outstanding cameras. However, no camera can shoot exceptional photos forever. At some point, Canon owners will find themselves looking to get their cameras repaired. 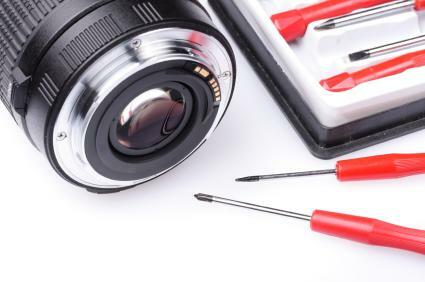 If you own a Canon camera that is in need of repair work, keep in mind that the company doesn't pay to fix affected cameras that are out of warranty. Request estimate. Fill out the online estimate request for the cost of repairing your camera. Repair information. Provide information about the problem with your camera. Repair checkout. Provide warranty information or see how much repair will cost out-of-pocket. Review repair request and shipping. Review and print your repair confirmation sheet. Ship your product with the repair confirmation sheet to a Canon factory service center. If you have questions about Canon camera repairs, you can also call the company direct at 1-800-OK-CANON and speak to a customer service representative. If you don't feel comfortable shipping your favorite camera to a Canon factory service center, you have the option of hand carrying your unit to an authorized Canon dealer. These locally run camera repair shops are located throughout the United States and are staffed with highly trained technicians. Authorized Canon repair centers obtain service agreements with Canon, which allow them to perform top quality fixes on-site. The local technicians receive training directly from Canon, in addition to product support and preferred access to Canon camera repair parts. Authorized Canon repair shops guarantee professionally fixed cameras using factory direct parts and fast turnaround times. Authorized Canon shops also have proprietary hardware and software to help calibrate your camera back to its original manufacturer specifications. When cameras break, some owners try to fix the problem themselves. If you own a Canon camera, this option is not recommended. The company uses specific parts that are unique to Canon cameras. By replacing them with generic versions, you risk compromisng the integrity of your camera. In addition, you may further exacerbate the problem, which could lead to a bigger repair bill should you have to get help from a professional technician.